[Note: It feels strange to be writing about our trip to Dry Tortugas National Park and Biscayne National Park while those Parks are closed and damaged and while Florida is just beginning to recover from the devastation of Hurricane Irma. But these places will reopen and recover, and any part this website plays in encouraging more people to visit these Parks and spend money this winter and in years to come in the Florida Keys will, I hope, help in some small way. As 2016 aged, Sean and I reached the conclusion of our aim to calibrate the National Parks that we had visited so that by the end of the National Park Service Centennial year we would have been to the same National Parks. After our descent of the Grand Staircase, Sean had been to twenty-one Parks to my twenty Parks since he had been to Dry Tortugas National Park during a spring break trip to Key West while he was at Michigan State University in the 1990s. He had caught up to Yosemite, Shenandoah, and Grand Canyon, and now it was my turn. We would, logically, add Biscayne National Park to our trip, thereby ending 2016 with our visited-Parks number at a not-too-shabby twenty-two. Dry Tortugas National Park in the Gulf of Mexico some seventy miles west of Key West, Florida had long been on our friend Nick’s bucket list. He’d known some people who had camped on remote Garden Key in the shadow of nineteenth century-era Fort Jefferson and he wanted to do the same. From the first time that we’d reached out to friends years earlier near the beginning of the project, Nick had said that he wanted to join for the Dry Tortugas trip. We had talked informally (often while dining at Food Life after visiting the Lego Store in Chicago’s Water Tower Place) for a few years about when we might do Dry Tortugas, but the 2016 calibration made it very real. It was time to do some actual serious planning. Nick was a given, as was Juan, who had grown up in Miami, but had never been to Dry Tortugas. We cast a wide net for interested people, and the most consistent yes was Adam from Detroit, who had joined Sean and me for the inaugural trip to Isle Royale and had joined for Virgin Islands. Adam’s husband, Phil (who had also joined for those earlier trips) declined for Tortugas, so Adam asked his friend and housemate Kamrin and Kamrin’s nine-year-old son, Ion. Beyond them, we had a bevy of people who were interested or were interested if we were thinking about particular dates or wanted us to let them know what we decided. In practice, we resolved to pick dates and then let others know what was up and they could join for all or part of the trip if they desired to. By summer 2016, we were looking seriously at going either around the New Year or sometime in November. I began looking into options that would work for the core group of Sean and me, Nick and Juan, and Adam, Kam, and Ion. Late December was, unsurprisingly, expensive for airfare, so we looked more intently at November, ultimately deciding on the week before Thanksgiving (Saturday, November 12 through Sunday, November 20). Originally, we’d envisioned flying into Miami, driving down to Homestead or Key Largo, doing Biscayne National Park, then continuing down the Keys to Key West and then a few days camping on Dry Tortugas. Ultimately, that plan got reversed a bit by the ferry schedule. 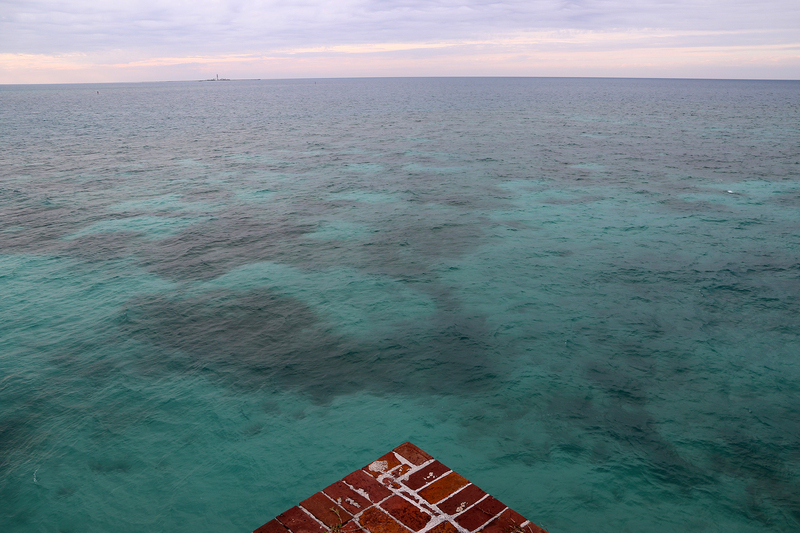 The only ways to access Dry Tortugas National Park are by ferry, seaplane, or private boat. The ferry service made the trip daily, but there was a limit of ten campers any given day. For the week we wanted, the best days were to go out on Monday and return on Wednesday. On Monday, there were eight camper seats available (and Wednesday there were ten) at the time we booked. So, our core group already took seven of the eight spots. We snapped up the eighth ticket too. The campground accommodates more than ten campers, so we were a little surprised that more people couldn’t go. I guess it makes sense given private boats, seaplanes, and different arrival and departure dates for different groups, but still. Ultimately, the eighth seat went to our friend, Noah. It was with Noah that Sean had visited Dry Tortugas almost twenty years earlier when they decided to spend spring break at Key West shortly after they met at MSU. Returning to Dry Tortugas with Noah almost two decades later added an extra layer of meaningfulness to the trip for Sean. After booking the flights and the ferry tickets, I booked us places to stay on Key West and Key Largo. We went with houses (through VRBO and Air B&B). Key West was tricky because the trip to Dry Tortugas fell in the middle of our time there, but the owner of the house we rented had been to Dry Tortugas many times and didn’t bat an eye our need to book for two nights, be gone for two nights, and then book for two more nights. When I went to book a boat tour at Biscayne National Park, it turned out that there wouldn’t be one in our possible window of time for the Park. So we instead booked kayak rentals so that we could spend the day paddling at Biscayne. This entry was posted in Journey and tagged Biscayne, Dry Tortugas, Florida, Florida Keys on September 17, 2017 by Brandon Hayes.